Virginia is blessed with four mountain resorts that appeal to individuals, couples and families winter, spring, summer and fall, with activities for every season, skill level and temperament. Whether you're in the mood for an action-packed vacation or lounge-by-the-pool spa getaway, Virginia's Mountain Resorts — Bryce, The Homestead, Massanutten and Wintergreen — will raise your discriminating tastes to new heights. Nestled in the Allegheny Mountains, Bryce Resort in Bayse is a 400-acre member-owned resort that is open to the public. Facilities include the main Lodge — with the Bryce Restaurant and Copper Kettle Lounge — that overlook the magestic Allegheny Mountains. Other buildings include the Ski Cafeteria, Ski Boutique and Ski Ticket Office as well as the Ski School, ski repair and equipment rental facilities. Late Fall through March - Skiing and snowboarding on eight slopes, two chair lifts and three rope tows dominate the activities at this time of year. 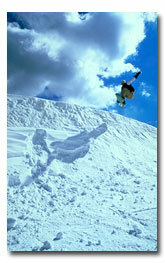 Slopes are classified as Beginner - 34 percent; Intermediate - 33 percent and Advanced - 33 percent. Night skiing is offered, too! Snow Tubing at Ridge Runners Park is the newest thrill at Bryce Resort and includes a carpeted lift back up to the top! 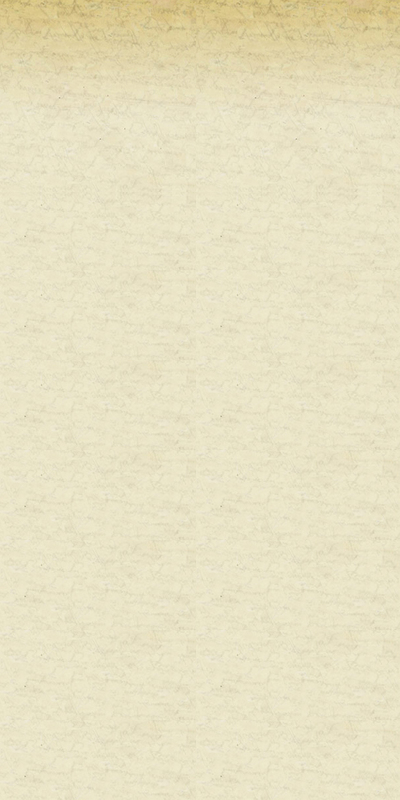 No skills needed! Early Spring through Fall - Weather permitting, golf is played year around at Bryce. The championship mountain course offers inspired challenges with plenty of trees and a creek that meanders through the course. Practice at the driving range and putting green and make some time for a lesson. Lake Laura is a great place to swim, fish, raft or boat. Equipment can be rented right there at the lake. And although the snow has melted from the slopes, athletic people love mountain boarding and grass skiing, and everyone can enjoy the scenic chair lift rides to the top of the mountain. Other outdoor activities include swimming in the outdoor pool at the condominiums, tennis, the Stoney Creek Lilliputt miniature golf course, horseback riding and hiking along North Mountain Trail. 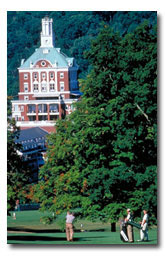 The Homestead in Hot Springs is surrounded by the Allegheny Mountains and covers 15,000 spectacular acres. With 506 luxurious rooms and suites reflecting the Georgian style, The Homestead also features 10 places to eat — from the elegant main dining room with continental cuisine to the Cottage Cafe, a soda fountain '50s hangout — several boutiques and a world-class spa. The Jefferson Pools are natural hot mineral spring waters, where guests can soak like Thomas Jefferson did back in 1818. 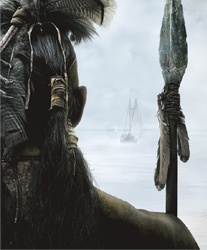 Their restorative powers have been documented in history books. Late Fall through March - Skiing — downhill and cross-country — and snowboarding at the new Playland Terrain Park are just some of the adventures this time of year! Snow Tubing, snowmobile and snowshoeing tours, as well as an Olympic-sized ice skating rink make The Homestead truly a winter wonderland. There's even a bowling alley for indoor sport lovers. Early Spring through Fall - Three Golf Courses present golfers with different challenges, such as The Old Course, which dates back to 1892! Slammin' Sammy Snead began his golf career here, and the Golf Advantage School will help fine-tune your game. There's something for everyone at The Homestead. Take a ride in a horse-drawn carriage or horseback ride Western or English saddle on trails through the forest. There's swimming in either indoor or outdoor pools, tennis on 12 clay or hard courts, hiking and biking on trails throughout the resort — especially to the 13 waterfalls of the Cascades Gorge! Join experienced guides on a caving tour, too. Other unique activities include fly fishing with an Orvis guide, falconry, and shooting at sporting clays or targets. Paintball, hayrides and a Family Challenge Course make every visit a new adventure! This year-around timeshare vacation resort near Harrisonburg in the Shenandoah Valley is open to the public. Massanutten Resort's accommodations range from hotel rooms in the main lodge to large four-bedroom condominiums with fireplaces and hot tubs. Other amenities include two indoor recreational facilities and a variety of restaurants and shops on the mountain. Late Fall through March - Enjoy skiing with all 14 trails lit up for night skiing, too! Slopes are classified as Beginner - 30 percent, Intermediate - 35 percent, Advanced - 35 percent spanning 70 skiable acres. With seven ski lifts, including a quad chair lift to the highest peak, you're not waiting in tow lines very long. Plus, skiiers age 70 or older can ski for free! Although snowboarding is allowed on the slopes, Massanutten's Terrain Park for snowboards and skiblades features ever-challenging obstacles throughout the season. Snow Tubing in the family-fun-loving Tube Park is considered a must! Early Spring through Fall - Golf is played year around on Massanutten's two championship golf courses, Mountain Greens on the top of the mountain and Woodstone Meadows at the bottom. Golfers can try the driving range and take lessons, too. One of the most exciting addition to Massanutten is the Water Park, which will open in this coming summer 2005. In addition, the Terrain Park becomes a Skate Park during this time of year. Enjoy hiking and biking trails at the resort, two stocked fishing ponds, tennis and equipment rental for every sport, including canoes and kayaks. Wintergreen in the Blue Ridge Mountains is understated elegance, and yet visitors can dress casually, everywhere! The resort sits on 11,000 acres — 4,000 feet high — and has 30 miles of hiking and biking trails. Amenities include hotel rooms in the main lodge to studio condominiums and seven-bedroom mountain homes, six restaurants — from the gourmet Copper Mine to the casual fare The Edge — a gallery of shops and the Wintergreen Nature Foundation. 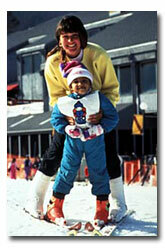 Late Fall through Early Spring - Enjoy skiing and snowboarding on 23 slopes and trails, 13 lit up for night skiing. Five ski lifts — two are six-person high speed — get you to the mountain tops fast. 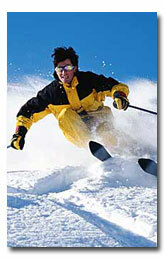 Slopes are classified as Beginner - 20 percent, Intermediate - 42 percent, Advanced - 21 percent, as well as Expert - 17 percent. Snow Tubing is a family favorite on two tubing parks. The Plunge is a 900-foot, 10-lane hill dubbed "the ultimate scream machine!" And The Slide is for youngsters and those who want their thrills a bit tamer. Early Spring through Fall - Wintergreen offers two golf courses, Devils Knob on the mountain and Stoney Creek in the valley and was rated in the Top 50 Golf Resorts in the Nation by Conde Naste Traveler. 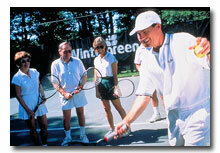 Tennis can be played on 15 outdoor mountain top courts, three indoor courts and four poolside courts. Lessons for adults and juniors are available, too. The Spa and Fitness Center includes a pool and world-class spa treatments. Learn rock climbing, play miniature golf, and enjoy the Skate Park at Wintergreen's Out of Bounds Adventure Center, a family favorite!